Hip Hop Flood Relief – Briggs, M-Phazes and more! 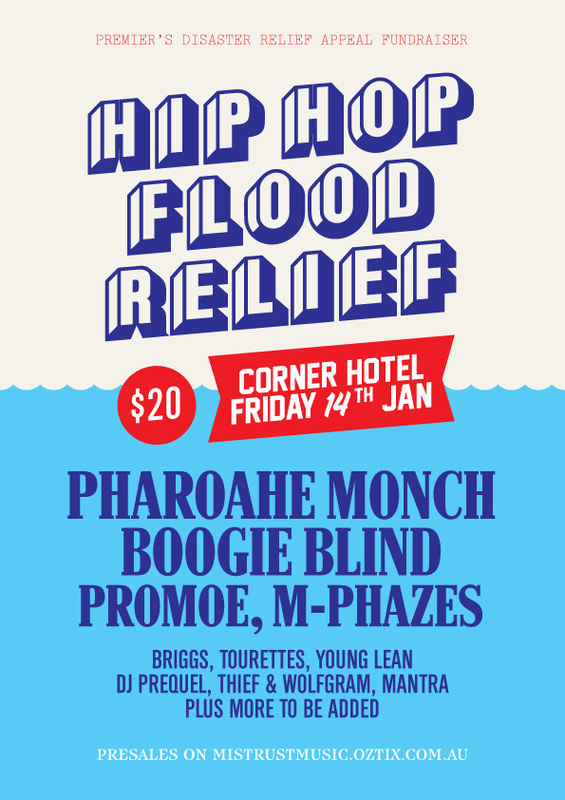 Hip Hop Flood Relief with Pharoahe Monch and Boogie Blind, this Friday night at The Corner Hotel. It’s been a devastating week for Queenslanders, so New York and local Hip Hop artists have rallied together with Mistrust Music to raise money for the flood victims. Just recently on our shores, Pharoahe Monch is back with his mind blowing technical skills and lyrical mastery. Joining him is Boogie Blind from the legendary X-Ecutioners plus a host of Aussie talent. More acts to be announced soon! Pharoahe Monch, Boogie Blind, Promoe (Looptroop), Briggs, Tourettes & Young Lean, Mantra, Prequel, Thief & Wolfgram and M-Phazes all playing under the one roof to do their bit for the flood victims. Please come and join Hip Hop’s finest artists and show your support. All proceeds go to the Premier’s Disaster Relief Appeal.